The ICSID Reports contain decisions rendered by arbitral tribunals and ad hoc committees set up within the framework of the Centre established pursuant to the ICSID Convention and other related decisions. The World Bank Convention on the Settlement of Investment Disputes entered into force in 1965. 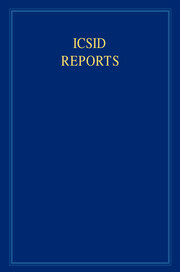 An international dispute settlement system which is of great and growing importance, its reports are now presented in these volumes in consolidated form for the first time, together with materials related to the ICSID cases from national courts around the world. All the decisions are presented in English with summaries, and are translated from other languages where necessary. These reports are an invaluable working tool for lawyers and scholars working on international investment issues and in international arbitration. ICSID Reports: Reports of cases decided under the Convention on the Settlement of Investment Disputes between States and Nationals of Other States 1965, and related decisions on international protection of investments - currently edited by Dr Michael Waibel and Professor Jorge Vinuales. More information on the series can be found on the Cambridge University Press website.